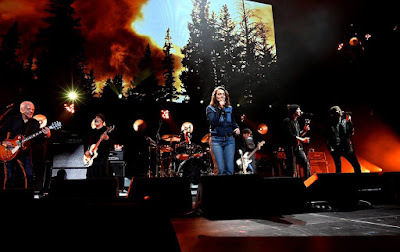 Soundgarden reunited last week for the all-star "I Am The Highway: A Tribute To Chris Cornell" concert at The Forum in Los Angeles, and video of the band’s full performance from the show is streaming online. The group delivered an 8-song set of classic hits and deep cuts (see list below), with guest appearances by Taylor Momsen, Marcus Durant, Tom Morello, Wayner Kramer, Pearl Jams’ Stone Gossard, Talyor Hawkins of the Foo Fighters and Buzz Osbourne of The Melvins before the night’s finale of “Black Hole Sun” with vocalist Brandi Carlisle and Peter Frampton. The evening closed with a lengthy feedback session by guitarist Kim Thayil and bassist Ben Shepherd. Hosted by ABC-TV’s Jimmy Kimmel, the event saw the first performance by the three surviving members of the Seattle band following Cornell’s passing in May of 2017 at the age of 52.